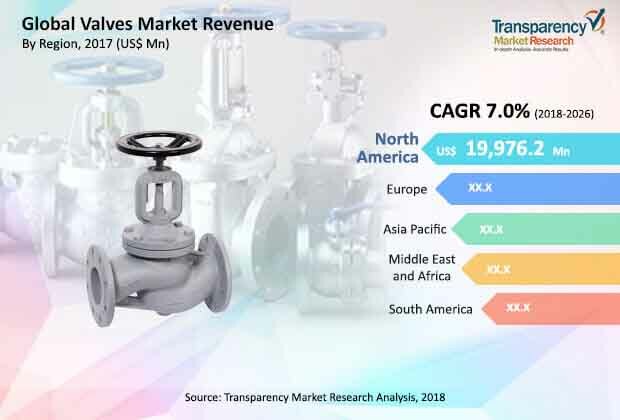 According to a new market report published by Transparency Market Research the global Valves market was valued at US$ 60,906.1 Mn in 2016 and is expected to expand at a CAGR of 7.0% from 2018 to 2026, reaching US$ 117,865.0 Mn by the end of the forecast period. According to the report, the global valves market will continue to be influenced by a range of macroeconomic and industry-specific factors. Asia Pacific will continue to be at the forefront of global demand, with the market in the region growing at CAGR of about 8.5% throughout the forecast period. Global valves market is majorly driven due to increasing number of oil & gas exploration activities in regions like North America and Middle East & Africa. Valves act as key components in the onshore and offshore oil and gas activities, where there has been an increase in their application due to the adverse corrosive conditions and high pressure conditions experienced on refineries and production platforms. Demand for valves is consistently increasing due to the benefits they offer in terms of pressure or temperature control throughout upstream, midstream, and downstream activities in the oil & gas industry. Furthermore, high growth in the pipelines sector along with the developments in the renewable energy projects are driving the demand for the valves. The report offers detailed segmentation based on the product type and industry. In product type, ball valves segment held the higher market share in 2016 contributing to the highest revenue for market. This segment is expected to increase at a CAGR of approximately 6% over the forecast period of 2018 to 2026. This is mainly attributed to the rising usage of these valves in the residential sector for flow control mechanism of water flow, room heating, and gas systems among others. Certain industry verticals such as chemicals, pulp & paper, and wastewater management also utilize these type of valves. Butterfly valves segment is predicted to rise with the significant CAGR of 7.0% during the forecast period. Butterfly valves use a disc for regulating the flow of fluids. Butterfly control valves have various applications in the industrial sector such as in reverse osmosis, brine flow control, steam systems, desalination systems, and petroleum production and refining among others. Furthermore, amongst the industries covered in the report water & waste water treatment industry was the topmost revenue generating segment which contributed almost 21% of the global revenue of valves market. Rising number of water treatment plants across the world has propelled the adoption of various valves in the wastewater treatment sector. On the other hand, oil & gas industry is predicted to rise with a CAGR of 7% during the forecast period from 2018 to 2026. The demand for valves in the oil and gas industry is primarily due to its application in each stream (upstream, midstream, and downstream) of the oil & gas industry. The valves applications in the oil & gas industry includes flow isolation, automatic re-circulation, gas outlet back pressure control, and slug catching among others. Demand for valves in this industry is continuously increasing due to the benefits they offer in terms of pressure or temperature control throughout upstream, midstream and downstream activities. The global valves market comprises of large as well as mid-sized valve manufacturers and suppliers. The vendors present in valves market are currently focusing on introducing efficient valves with increased pressure control capacities. Moreover, the vendors are adopting partnership and acquisition strategies to proficiently compete in the regional market. Some other significant players engaged in Valves market in Global include Industrial Scientific AVK Holding A/S, Rotork Plc, General Electric Company, Goodwin International Ltd, Schlumberger Limited, Flowserve Corporation and KITZ Corporation.